The best word to describe the credit cards offered by Credit One is confusing. When you start the application process, you don’t know what kind of card you’re eventually going to wind up with — including important details like fees, rates, rewards, even whether you get a grace period. When you send in a payment on time, you don’t know whether it will be credited to your account soon enough to avoid a late fee. The issuer often takes a week to process payments, while many cardholders encounter difficulties paying online, according to thousands of complaints about Credit One made to the Consumer Financial Protection Bureau and state regulators. The credit card terms and conditions posted on the issuer’s website — a critical source of information about any card — is a generic statement intended “for informational purposes only” at Credit One. You don’t get to see your actual terms until you qualify for a specific card. The issuer’s name and logo are similar to those of better-known issuer Capital One, which has led some consumers to think they were applying for a card from the latter. Credit One markets credit cards for people with less-than-great credit. In its defense, the issuer says that in order to make cards available to as many of these subprime borrowers as possible, it has to do things differently from what you see with cards for higher-credit consumers. Fair enough, but the confusion is real, so be warned and be careful when applying. Prequalification is optional with most issuers, but it’s an integral part of the Credit One application process. You must prequalify in order to learn the exact fees, rates and rewards structure of the card you’ll be applying for. Once you see those terms, you decide whether to apply and incur the hard inquiry. The application review is deeper than a “prequal” review, so you could still be rejected, or you could be approved for different card terms than what you saw after prequalification. Credit One says this prequalification process protects subprime consumers, who can least afford to lose points off their credit scores. For example, say an issuer offers three cards with annual fees of $99, $45 and $0. Someone with bad credit might qualify for the $99 card but not the other two — but they would probably apply for the $0 card first, then the $45 card and finally the $99 card as a last resort. Their credit score would suffer the impact of three applications rather than one. Credit One, by contrast, might offer a single card with a dozen potential combinations of rewards, fees and rates. You apply once, and the issuer approves you for terms based on your creditworthiness. So there is a benefit, but there’s also an extra hoop to jump through, and you don’t know what you’re getting (or likely to get) until you’ve already begun the application process, at which point you may be less likely to bail out. The bottom line is that you won’t know how you’ll earn cash back until you get your card. Rewards are automatically redeemed as a statement credit each month, so at least that part is fairly straightforward. The interest rates cited on the “for informational purposes only” disclosure were 19.74% to 25.74% as of August 2018. If you have bad or limited credit, the interest rates you’ll pay on any card or loan will be on the high side. Credit One’s rates are in line with those on typical credit cards for bad credit. As with other key features of Credit One cards, the annual fee you’ll pay is a mystery until the issuer qualifies you for a card. Your annual fee the first year will be “between $0 and $75.” For the second year and beyond, that range expands to between $0 and $99. After the first year, your annual fee might be billed in monthly installments. Or it might not. Some Credit One credit card agreements — “real” terms and conditions that will ultimately apply to cardholders — are included in this document. As of August 2018, it outlined 31 different combinations of APRs, annual fees and other card features. Again, the one that applies to you will be disclosed only after you qualify for a card. As of August 2018, that document included seven different annual fee structures: $0 first year/$0 after that; $0/$39 (billed annually); $39/$39 (billed annually); $45/$45 (billed annually); $60/$60 (billed monthly); $75/$99 (billed annually); and $75/$99 (billed monthly). On most credit cards, if you pay your balance in full each month, you automatically get a grace period — that is, you won’t be charged any interest on purchases until your next payment due date. Pay in full each month, then, and you’ll never be charged any interest. With the Credit One cards, however, you can’t tell upfront whether you get a grace period. In the “for informational purposes only” terms, there’s a section on “paying interest.” It begins, “If your Account has a Grace Period …” That’s a big “if.” It goes on to say that if your account has no grace period, you will pay interest on every purchase from the time it is posted to your account. As with most key details about Credit One cards, you won’t know whether you get a grace period until you apply. Of 31 card agreements spelled out by Credit One as of August 2018, about half had a grace period. A NerdWallet investigation published in October 2018 found thousands of complaints about Credit One that, because of a loophole in federal law, hadn’t been visible to consumers. Payment issues come up repeatedly in those complaints, as well as in comments posted in other forums. Consumers describe sending in a payment before the due date, only to have Credit One fail to process the payment until it was “late.” In other cases, consumers were unable to pay through the Credit One website and had to pay by phone or mail, incurring additional fees. Credit One declined to comment on the findings of the investigation, but its stated policies on processing payments appear to verify the complaints. Most credit card issuers will apply a payment to a cardholder’s account immediately. Credit One says it will hold onto your payment for several days — unless you chip in a nearly $10 fee to have it processed within a day. WHEN WILL YOUR PAYMENT BE CREDITED? As with all credit cards, the balance on your Credit One card is made up of your purchases, cash advances (if any), interest and any fees that are applied. The minimum payment on Credit One cards is 5% of the balance. For most credit cards, the minimum payment is 1% to 3% of the balance. After one billing period, Credit One cardholders may call Customer Service and choose their own due date as long as it’s within six days before or after the original date. Cardholders may choose a different due date once every six months. If you choose Express Payment, your “funds will become available sooner (usually the next business day).” However, the fee for an Express Payment is $9.95. Even the language Credit One uses is peculiar. We’ve never seen a credit card agreement with wording about when “funds will become available.” That kind of language usually applies to bank account deposits, so we can’t be sure what it means in this context. But we assume it indicates when the payment will post to your account. When does your available credit refresh? To the extent that a payment reduces the principal amount outstanding on your Card Account, new credit will be available (subject to your credit limit), but only after 12 calendar days after our receipt of the payment. This seems to indicate that regardless of when you make your payment — on time, late, Standard, Express — you can’t access your total available credit line for nearly two weeks afterward. Say your credit line is $500, and you’re maxed out. You pay off your balance — but you still can’t use your card for 12 more days. To try to get clarification, we called the “Application Information” number listed by Credit One, but we couldn’t get past the first branch of the phone tree. That’s because to ask a question about applying for a Credit One card, you have to enter the 16-digit number of your Credit One card. Credit One cards are issued by Credit One Bank of Las Vegas, which is a subsidiary of Sherman Financial Group, a private company based in Charleston, South Carolina. In addition to the complaints to government agencies uncovered by NerdWallet, payment issues are common in complaints about Credit One credit cards on the Consumer Affairs website. Many reviewers say they tried to pay their bill online, but the Credit One website was not working. Or they made a payment, but it wasn’t credited to the account in a timely fashion and triggered a late fee. There are more than 1,000 complaints about the company and its customer service on Consumer Affairs. Complaints about Credit One on Yelp also touch on customer service, billing and payment issues. Of 129 reviews on Yelp as of February 2017, 110 gave Credit One one out of five stars. The Better Business Bureau has not given Credit One a rating. Of 112 reviews as of February 2017 on the website of the southern Nevada BBB, three were labeled as positive (although the tone of one was sharply negative), three as neutral and the rest as negative. Of 783 complaints logged on the site, 574 were identified as billing or collection issues, which includes payment problems. Another benefit touted by Credit One is its “Credit Protection Program.” This is an optional program that waives the minimum payment due for six months if the primary cardholder “involuntarily” becomes unemployed or disabled. The cost of this benefit is 96 cents for every $100 of your balance due. You pay this every month after you enroll. For example, if you have a balance of $500 one month, being in the program will cost you $4.80 that month; if your balance the next month is $400, you’ll be charged $3.84 that month, and so on. Once you enroll in the program, there is a 30-day waiting period before you’re eligible to activate its coverage. When you activate, your account is closed, and you cannot use the card; the minimum payment is waived, but interest will continue to accrue. Also, Credit One has the right to cancel your enrollment if your account is 60 days past due, your account is 20% or more over the credit limit, Credit One “no longer owns the account,” you have committed fraud, or you’re in one of Credit One Bank’s debt management programs. Because these are Visa cards, cardholders get the Visa travel accident coverage and car rental collision damage waiver insurance. The cards also have Visa zero fraud liability, and the terms and conditions warn cardholders that they must report unauthorized charges immediately. While federal law limits cardholder liability to $50 for unauthorized charges, the Visa zero fraud liability guarantees you won’t be liable for fraudulent charges. The cards offer free credit scores, but you can get your credit score for free just about everywhere these days — including on NerdWallet. Some credit card issuers will give you a free score even if you’re not a cardholder. You can choose from an array of designs (23 for the rewards card, 20 for the rebuilding-credit card) to “personalize” your credit card, but you may pay a fee for that option. That fee is not disclosed in the terms and conditions available on the website. 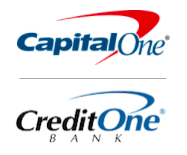 Credit One’s name and logo are similar enough to those of Capital One to confuse some consumers. Considering the opaque terms and other drawbacks of Credit One cards, you might wonder why so many people apply for them. One answer might be that consumers think they’re applying for a credit card from Capital One. Bloomberg has noted that Credit One’s swooshy logo actually predates Capital One’s, but confusion remains in the marketplace. Consumers who complained on the Consumer Affairs website mentioned this issue frequently. Credit One cards are marketed to people with less-than-good credit, but better alternatives are available. Major issuers offer secured credit cards with better terms, lower fees and guaranteed grace periods. Secured cards require an upfront security deposit of at least $200 to $300. Getting that money together can be a challenge for some, but keep in mind that you get that money back when you close the account or upgrade to a regular unsecured card. The fees charged by Credit One are not refunded. For instance, the Discover it® Secured pays 2% cash back up to $1,000 in spending on gas and restaurants per quarter and 1% cash back on all other purchases. Plus, after you have managed your card responsibly for eight months, Discover may review your card with an eye toward upgrading you to an unsecured card. On top of that, its annual fee is $0. You might also qualify for a real Capital One card, the Capital One® Secured Mastercard®. You could get a $200 credit line with a deposit of as little as $49, depending on your credit, and you can pay the deposit in installments before activating your account. When you make your first five payments on time, you may get access to a higher credit line without putting more money down. And the annual fee is $0. If your credit is fair or average, you could qualify for the Capital One® QuicksilverOne® Cash Rewards Credit Card. This unsecured card offers an unlimited 1.5% cash back on all purchases for an annual fee of $0. When credit is limited, consumers may make bad decisions, like applying for a Credit One credit card without doing their homework. Look around, and you can find better choices — with terms and conditions that are clearly spelled out.